This is a wonderful 3 mm comfort fit set. 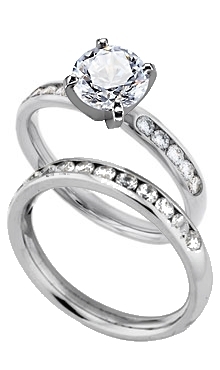 The rings have 22 channel set matched .03 carat diamonds with a color of G-H and a clarity of VS. The engagement ring is set with 10 diamonds and the wedding band is set with 12 for a total weight of both rings of .66 carats.